Drought is an extended period of exceptionally low precipitation. A drought can feature additional weather characteristics, including high temperatures and high winds. Although low precipitation (rain, snow, or sleet) marks both droughts and deserts, the two are different. A desert is a region that experiences low precipitation as an everyday occurrence. A drought, on the other hand, is a temporary condition in which precipitation is abnormally low for a particular region. Droughts may occur at any time in any part of the world and last anywhere from days to weeks to decades. The U.S. National Weather Service recognizes three categories of drought. A dry spell occurs when there is less than .03 inch (.08 centimeter) of rainfall during a minimum of 15 consecutive days. A partial drought occurs when the average daily rainfall does not exceed .008 inch (.02 centimeter) during a 29-day period. An absolute drought occurs when there is no measurable rainfall over a period of at least 15 days. The intensity of a drought may be measured by the ability of living things in the affected area to tolerate the dry conditions. Some plants quickly fall prey to droughts while others, such as cacti and mesquite trees, survive dry conditions by either storing water in their tissues or by going dormant (a state in which growth activity stops). Although a drought may end abruptly with the return of adequate rainfall, the effects of a drought on the landscape and its inhabitants may last for years. Droughts have taken place around the world throughout history. Some scientist theorize that droughts brought about the migrations of early humans. From 1876 to 1879, severe droughts in China caused the deaths of millions of people from lack of food. In 1921, a drought along the Volga River basin in Russia led to the deaths of almost five million people, more than the total number of deaths in World War I (1914–18). The best-known American drought occurred on the Great Plains region during the mid-1930s. Labeled the Dust Bowl, the affected area covered almost 50 million acres in parts of Colorado, New Mexico, Kansas, Texas, and Oklahoma. 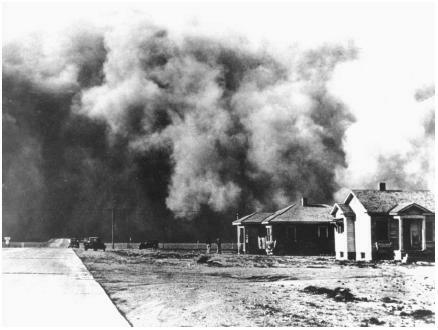 During this period, dust storms destroyed crops and buried agricultural fields with drifting sand and dust. As depicted by American writer John Steinbeck in his award-winning novel The Grapes of Wrath, many farm families had to abandon their land. Drought and famine have severely affected areas throughout Africa. Beginning in the late 1960s, in the Sahel region south of the Sahara Desert in northern Africa, a prolonged drought contributed to the deaths of an estimated 100,000 people. The region was struck again by drought in the mid-1980s and early 1990s. War and drought in Ethiopia in the early 1980s brought about the starvation of an estimate one million people and the forced migration of hundreds of thousands of others. border war between Eritrea and Ethiopia slowed the delivery of famine aid. Devastating civil wars also worsened the effect of drought in the countries of Afghanistan and Tajikistan. The unrelenting droughts were the worst those countries had seen in decades. The El Niño weather phenomenon typically brings about droughts in various parts of the world as it disrupts normal weather patterns. Perhaps one of the worst such droughts occurred in Southeast Asia as a result of the 1997–98 El Niño period. The monsoon rains that normally drench the area each September were delayed. Consequently, the jungle fires set by farmers to clear land were not damped by the usual rain, but instead raged out of control, propelled by hot winds. The smoke from the fires hung over Southeast Asia like a thick, dirty blanket. It quickly became the worst pollution crisis in world history. At least 1,000 people died from breathing the toxic air; several hundred thousand more were sickened. Soil that lacks humus (nutrient-rich material resulting from decaying plants) and the binding property of plant roots cannot absorb or retain moisture properly. Dry, crusty soil is easily moved by winds. The overgrazing of farm animals, the overcultivation of farmland, and the clear-cutting of forests all contribute to such soil conditions, adding to the severity of droughts.